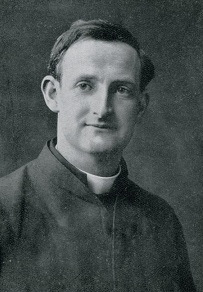 Silverstream Priory's good friend, Mr. Pat Kenny, shall deliver a talk entitled "Dalkey's Martyr - The Life and Spirituality of Father Willie Doyle S.J." on Monday May 20th at 7.30 p.m. in the Presentation Brothers' house in Glasthule, County Dublin. The talk will last for approximately 40 minutes, and will be followed by a discussion and some refreshments. The Presentation Brothers' house is directly across the road from St. Joseph's Church in Glasthule, and is just 2 minutes walk from Sandycove and Glasthule DART station - turn right when exiting the station and the house is about 100m up the road on the same side of the street. It is a large red brick building. Car parking facilities are available in a nearby public car park beside the DART station. The precise location of the Presentation Brothers' House can be found at the blue pin on this map. Admission is free and all are welcome. Pat may be able to make an audio recording of the talk available for those unable to attend. The talk is part of a series of talks entitled "Mondays at the Monastery" - readers may wish to support the other talks. Next Monday, May 13th, Michael Kelly, Editor of the Irish Catholic, will speak about renewing the Church in Ireland, and on May 27th, Father John Walsh O.P. will speak about the rosary. More than one reader has shared with me that the most helpful thing written on scruples and their treatment is a little pamphlet by Father Willie Doyle, S.J. Here is the link to Father Doyle's pamphlet: Personally, I would recommend that anyone struggling with scruples should not only read his pamphlet, but also seek his intercession. Father Willie Doyle is a powerful intercessor, and his burning desire in heaven is no different from the one that consumed him on earth: to make known the love of God, and to make God loved. It is a fundamental truth that we cannot love God unless we believe in His love for us. Scrupulosity completely represses such a belief, and thus paralyses all generous effort. At every moment it creates trouble between the soul and its Creator by pessimistic feelings about the past, and about its present dispositions and actions. The conclusions foolishly arrived at under the influence of these feelings boldly give the lie to the wise decisions of the confessor, and lead the soul to rebel against his spiritual guidance, and to put itself at the mercy of its enemy. Soon the soul, seriously believing itself to be in a bad way, becomes discouraged, and often begins to commit real sin. Even though sin does not follow from scruples, scrupulosity, nevertheless, retards the soul's progress in several other ways. It represents prayer as full of difficulties. It stops the ears of the poor downcast soul to the consoling voice of the Holy Ghost. It destroys confidence. It prevents the frequentation of the Sacraments, and thus stops their strengthening effects. It almost takes away the power of resisting temptation. It causes discouragement, and may even lead to despair. Window in Memory of Father Willie Doyle, S.J. 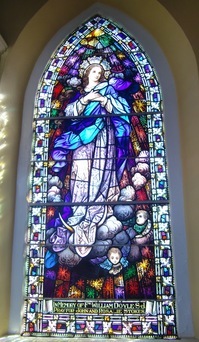 A dear friend of the priory wrote me the other day to say that, thanks to my post on Father Willie Doyle, S.J., on the anniversary of his death, 16 August, she understood the significance of the beautiful window of the Assumption of Our Lady given in his memory in Saint Finnian's Church, Dromin, County Louth. Father Doyle's devotion to Our Blessed Lady was profound and all-pervasive. Surprisingly, Alfred O'Rahilly's masterful biography of Father Doyle does not contain a chapter on his Marian devotion, nor is the Blessed Virgin Mary listed in the Index to Subjects at the end of the book. One must not deduce from this, however, that Our Blessed Lady is absent from the piety of Father Doyle. She is mentioned frequently, as if in passing. The presence of the Blessed Mother is a given. Hers is a hidden presence made more tangible by the ceaseless repetition of her sweet name and the touch of her beads.